Looking to recoup some money from your log home purchase? You can do this by renting your cabin to other vacationers. Many people are interested in making their money work for them by utilizing second homes and vacation homes as a separate income stream. But you want to be sure that people will rent, return and refer you to their friends and family and not damage your capital investment. This is certainly a viable proposition, but it’s not guaranteed. There are potential problems and pitfalls so let’s look at what we can do to maximize our possibility of success with an investment log cabin. Like all real estate, the mantra with renting your cabin is first and foremost location, location, location. Take a look at the most popular areas for cabin vacation rentals and you will see the obvious advantage in buying a vacation rental cabin in a busy area. The drawback, of course, is that it can be too busy, thus negating the attraction of the idea to begin with. On the other hand, a remote area without easy access has its own limitations. You need to find a balance between busy and remote, somewhere secluded yet accessible. People also want their rental to match the place - you don’t want a log cabin on a beach, but if you’re visiting the Smoky Mountains you also don’t want a beach cabana. By the way, if you’re curious these are the most visited national parks, from the National Park Service website. Once you’ve decided that you’re going to be renting your cabin and you have the cabin set up in such a way that you know people will be happy to rent, return and refer you to their friends, you need to decide on the best way to handle the business end of things. There are two different approaches to this: either professional property management or do-it-yourself. Property management companies handle all the grubby details of cabin vacation rentals, from advertising and collecting the money to cleaning the place after people have left. They also deal with the inevitable damage and cabin maintenance that occurs in any property. Property managers have good local contacts for repairs and maintenance people and you don’t have to deal with all those details from far away. What does this cost? There are different ways that property managers handle this, but typically you’re looking at a 60/40 split of the rental money; that is, you get 60% and they get 40%. 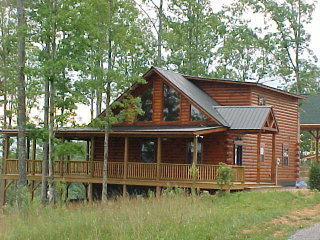 As cabin owner you are also responsible for the actual cost of repairs and upkeep on the property. This is a significant trade-off for the benefit of keeping the business at arm’s length. To find a good property management company, the best source would be to ask local realtors or other rental cabin owners. Ask for references and follow up. With these companies you have full control of check-in and check-out times, cabin rules, you answer inquiries, but all the money goes through them. Typically, Airbnb adds on 10% of the rental fee for their services, but that includes their screening of potential guests. Their rating system adds a level of reliability to an otherwise fairly anonymous system. If you sign up using the Log Cabin Connection Airbnb link you get $30 credit, and LCC gets $30 credit. You will also need to establish a good working relationship with some local builders or repairmen to handle property upkeep, as well as a local cleaning service who can clean and re-stock your rental cabin in between stays. You may want to check out our sample Cabin Rental Agreement page which also includes sample forms for Booking Confirmation, Pet Addendum and Rental Agreement Checklist. It’s a great idea to put together a binder for your rental cabin with pertinent information. Not only should you have emergency numbers for local hospital and police, you can also include an emergency contact for yourself or for another local person designated to assist you with non-emergency needs. Your book can include instructions for things like how to operate things like the hot tub or jacuzzi, where to obtain firewood, and optimal settings for heat or air conditioning. You can also make up a list of local attractions with opening times and admission prices. Maybe have brochures or maps to make things easier for someone’s stay at your rental cabin. Some rental owners even leave a bottle of wine or a coupon for a local site as a special thank-you for renters. It’s also a good idea to spell out exactly what you expect people to do when they leave. For example, you may want them to start the dishwasher, leave the key on the counter and lock the knob, or drop off garbage outside. This way there is no question about how you want things left when guests depart. What about about the necessity of getting insurance for renting your cabin? Typically, homeowners insurance is for owner-occupied properties and does not cover cabin vacation rental on a sporadic basis, nor will personal liability cover you. Check with your insurance agent to confirm if you need commercial insurance. Renting your cabin to other vacationers is a great way to share the fun of log home living and to make some money from your capital investment at the same time.